Nepali Society 3 | United We Blog! Lack of accountability mechanism, declining faith of public on judiciary, red tape scandals, inefficient and corrupt politicians and incompetent and greedy bureaucrats are major issues most Nepalis often talks about. Release of Nepali Congress leader Khum Bahadur Khadka, who was convicted of corruption in August last year, from Dillibazar jail today has once again brought the debate about corruption at the fore. Khum Badhaur dai matra bhrasta hoina. Dai hamro asthako Kendra hun, neta hun, daikko birruda shadayantra bhayeko chha (Khum Bahadur dai alone is not corrupt. We have faith on him and he is a leader. Some people has conspired him to put him behind the bar). 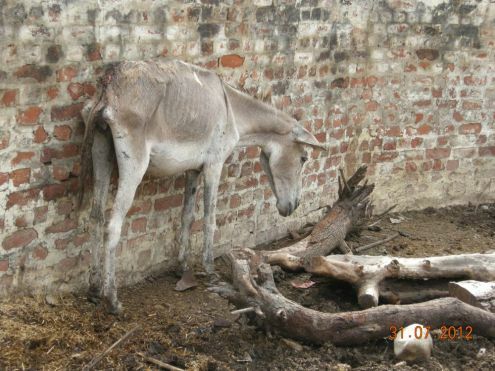 Very Hungry….a starved donkey in Nepalgunj. Whatever may be the rationale behind a cruel act, cruelty cannot be hailed. Nepal’s capital Kathmandu is cruel to animals. Stray dogs, cows, oxen and cats starve to death in this city where hundreds of thousands of humans struggle to make their ends meet. These unlucky animals are injured or killed in fights and there are dozens of hit and run cases by speeding vehicles leaving stray animals wounded and severely injured. The question is how long can this cruelty will continue in the capital city? Recently, staunch animal rights activists duo Pramada Shah and Lucia de Vries sent me an email including link to a YouTube video (below) in which Nepal Police personnel were involved in brutal killing of a dog. I was deeply shocked by seeing the video in which we can see that officers first shoot at the dog and then bludgeoned it to death with bamboo sticks- all in full view of the public. The incident, in Baluwatar, does not make us feel proud and civilized. I lost my confidence in my nasal hairs last month. I trusted him till last month. The last time I wore a mask was in 2005 when I was agitating and blogging against the then autocratic royal government. It was part of a political statement. Journalists were rallying for freedom. They wanted to show, by covering their mouths with black masks, that they didn’t have freedom of expression. As a statement against the autocracy, I kept that photo of mine—mouth covered with a black mask—on the front page of my website for several weeks. This time around there is no king to protest against. Now, a mask is a key part of my pollution survival strategy. I wear it whenever I walk on the streets or ride pillion. 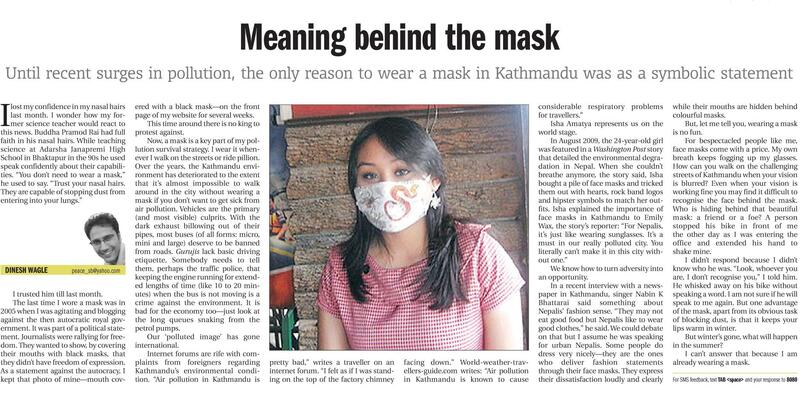 Over the years, the Kathmandu environment has deteriorated to the extent that it’s almost impossible to walk around in the city without wearing a mask if you don’t want to get sick from air pollution. Vehicles are the primary (and most visible) culprits. With the dark exhaust billowing out of their pipes, most buses (of all forms: micro, mini and large) deserve to be banned from roads. Gurujis lack basic driving etiquette. Somebody needs to tell them, perhaps the traffic police, that keeping the engine running for extended lengths of time (like 10 to 20 minutes) when the bus is not moving is a crime against the environment. It is bad for the economy too—just look at the long queues snaking from the petrol pumps. Our ‘polluted image’ has gone international. Nepal: A Country Cursed by a Widow?